Della Mirror with two stylish stripes and magnifying X3 lens. Della LED Mirror for bathroom is made of quality materials, special glass and European mirror sheet. 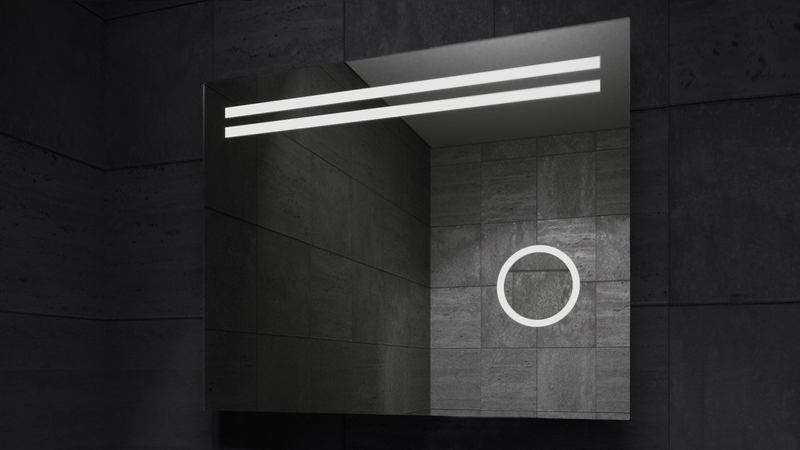 This model features x3 lens with lighting in the right part of the mirror, as well as two stylish stripes with lighting in the upper part of the mirror. Upon switching on this mirror, a hand motion at the bottom of the mirror turns on the hidden lighting (stripes), and the rim around the lens. This setting is exclusive in the market. Della LED is an above medium production complexity mirror. The standard components include: the imported 5 mm thick mirror sheet, the hand motion sensor switch, the triplex zoom lens. This model may be produced according to the customer dimensions and with a personal set of options. Width: 700 mm, 800 mm, 900 mm.